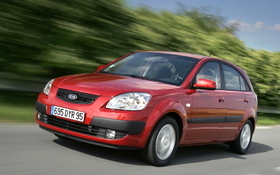 Through July, Kia Rio sales are up nearly 600% in Russia. Kia more than doubled its Russian new-car sales in July to pull within striking distance of Chevrolet, the country's top-selling foreign brand. Kia's July sales rose 105 percent to 10,502 vehicles, making it the top seller among non-Russian automakers for the first time this year, according to data from the Association of European Businesses (AEB). Chevrolet sold 8,986 vehicles in July, a 15 percent gain from the year-ago period. After seven months, the General Motors Co. subsidiary leads Kia by 5,765 sales (61,996 to 56,231). In June, Chevrolet had a 7,281 advantage over Kia, the AEB data shows. Kia's quick rise up the rankings is due to strong demand for the Rio subcompact, Cee'd compact and the Sportage medium SUV. Through July, Rio sales are up nearly 600 percent to 16,150 while the volume for the Sportage has nearly doubled to 11,617 from 6,014 after seven months in 2009, according to the AEB. New-car sales have been rising in Russia since a state sponsored scrapping scheme was put in place in March. Through July, the country's overall new-car sales are up 9 percent to 963,688 cars and light commercial vehicles. Sales halved during 2009 as the economic crisis and a lack of access to credit sent shockwaves through the market. Russia vehicle sales by manufacturer, July & 7 mos.